"Passing into History: Nazism and the Holocaust Beyond Memory,(History " by Geulie Ne'eman Arad, Steven E. Aschheim et al. Gavriel Rosenfeld is a contributing author, "The Architects' Debate: Architectural Discourse and the Memory of Nazism in the Federal Republic of Germany, 1977-1997", pp. 189-225. 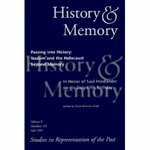 Book description: "History & Memory, Volume 9", numbers 1 and 2 - more than a decade has passed since the Historians' Debate erupted in Germany. The themes that were at the heart of that impassioned controversy continue to pulsate in historical thinking about the National Socialist era. As a result of the Historikerstreit, increased credence is being lent to the issues of historicization, national identity, historical consciousness, the 'guilt question,' and collective memory, which heretofore had been considered tangential in the historiographical context of the Nazi epoch. This special double issue reconsiders the central themes that surfaced as a result of the debate: the problematic of historical representation of the Third Reich and the Shoah as it passes from living memory; the place of personal and collective memories in historical narratives; and the uneasy question of who should/can/may write whose history/ies. Several of the articles in this volume which is dedicated to Saul Friedlander on this sixty-fifth birthday, will related to Friedlander's rich oeuvre, which has probed many facets of this highly charges past. Rosenfeld, G. (1997) "The Architects' Debate: Architectural Discourse and the Memory of Nazism in the Federal Republic of Germany, 1977-1997," in Geulie Ne'eman Arad, ed., Passing into History: Nazism and the Holocaust Beyond Memory,(special issue of History & Memory),Vol. 9 Nr. 1/2, Fall, 1997, pp. 189-225. Ne'eman Arad, Geulie; Aschheim, Steven E.; Brunner, Jose; and Rosenfeld, Gavriel D., "Passing into History: Nazism and the Holocaust Beyond Memory,(History & Memory-Volume 9 No. 1/2)" (1997). History Faculty Book Gallery. 19.